Jeff Jordan is a pioneer in transforming traditional marketplaces to e-commerce consumer based marketplaces and expanding business through product innovation. 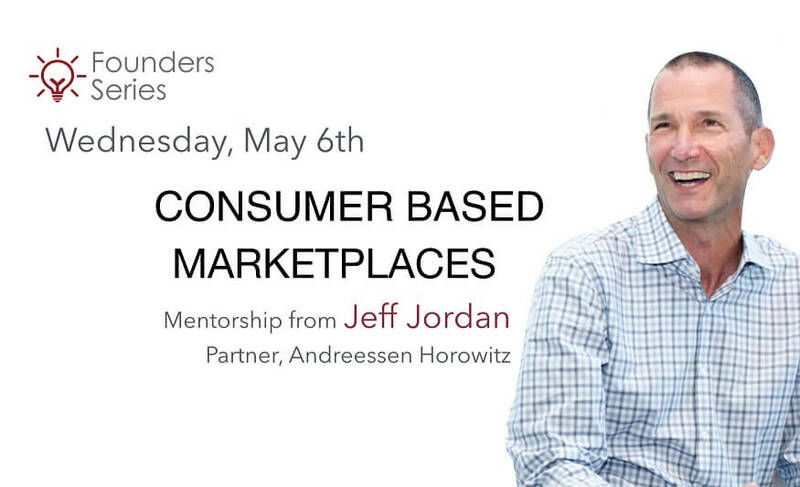 Join VLAB Founder Series, Wednesday, May 6th, for an evening with Jeff Jordan – Partner, Andreessen Horowitz and gain insights that you can apply to your own startup. The discussion will be moderated by Michael Copeland, Partner at Andreessen Horowitz. Jeff serves on the board of: Airbnb, Belly, Crowdtilt, Instacart, Pinterest, Walker & Company, and 500px. Jeff also oversees A16Z’s investments in Fanatics, Julep, and zulily. Jeff was chief executive officer and executive chair of OpenTable. Before Open Table, Jeff was president of PayPal making them the global standard for online payments. Earlier, as senior vice president and general manager of eBay North America, he drove the successful acquisitions of PayPal and Half.com. Before eBay, Jeff was chief financial officer of Hollywood Entertainment and president of Reel.com. Jeff holds an M.B.A. from the Stanford University Graduate School of Business, where he serves on the Advisory Counsel. Join us at our next VLAB Founders Series event to connect with other startup founders and gain personalized feedback from Jeff Jordan about the opportunities for change in our daily consumption and commercial activities. Founders Series events provide a unique opportunity for startup founders to take part in an interactive session. Come prepared with your burning questions! If you would like to have the rare opportunity to take the “Hot Seat” on stage with Jeff Jordan to receive feedback on your question, be sure to enter your question in the Registration Form. A few select startup founders will be notified prior to the event if they have been chosen to take the “Hot Seat”.